A couple weekends ago, we really wanted to get out and go for a hike despite the 90 plus temperatures outside. 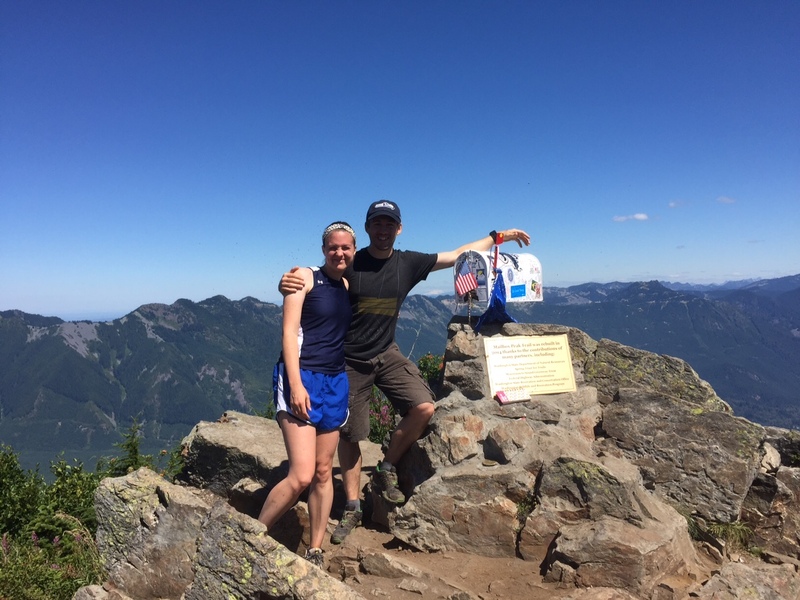 We decided to leave super early and hike up to Mailbox Peak. They created a new trail 2 years ago which is much safer and also has a more gradual incline although it is also twice as long. We got to the trailhead about 8am. The incline is constant but gradually going up until you meet up with the old trail. Then you go straight up from there on out. The trail near the top is quite dusty and there are loose rocks. Because of the heat, it seemed to kept the crowd numbers low. When we finally got to the top, there were flying ants everywhere. They were going in our mouths and noses while we were trying to take a picture with the mailbox. When the mailbox was opened the problem got much worse. Other than the bugs, the trail was definitely something to check off of our list. We tracked the mileage with our GPS and it was 5 miles up and 5 miles down on the new trail. I used hiking pokes which were a lifesaver for the big incline push at the end, but Mark hiked without poles and was totally fine. The view from the top was super clear. Rainier was out in all her glory and you could even see downtown Seattle with binoculars. This was definitely a good hike to do for our upcoming Half Marathon to get some time on toes in and cardio and hill training. After the hike, we went for a swim in Lake Sammamish on our way home. It was so refreshing and makes me question why we don’t do it more often. Otis, Fern and I took Mimi to see the daffodils today. Welcome to my little piece of the internet. My name is Lauren and I am an Interactive Producer living in Seattle with my husband. This blog is to share my life while I try to live the best story that I can. We love to cook, eat and generally explore the PNW. I also love to run and suffer with Ulcerative Colitis which I will share a little of my journey here on this blog. Thanks for visiting!